If A Quiet Place 2 is going to happen, the screenwriters behind the first movie have plenty of ideas for it. 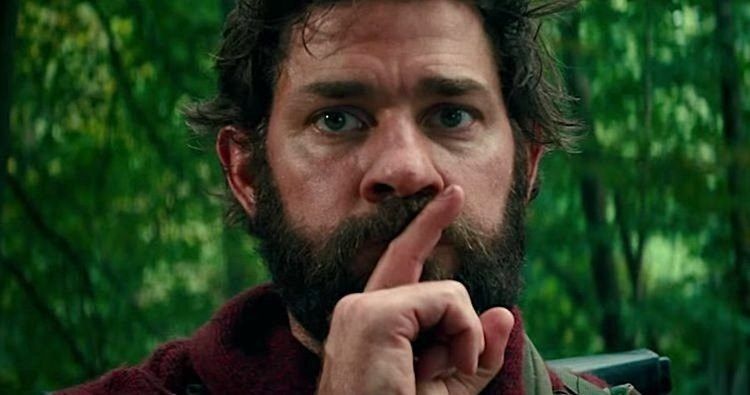 A Quiet Place opens in theaters this weekend and looks like it could be a pretty big hit for Paramount. So far, the movie has been heralded by critics ever since making its debut at SXSW. Given the way things work in Hollywood these days, if big bucks at the box office come as a result of the critical praise, it's not hard to imagine that a sequel could be in the cards. Scott Beck and Bryan Woods wrote A Quiet Place, with director John Krasinski stepping in to shape it a bit more once he came on board. I had the chance to speak with the screenwriters following the movie's premiere at SXSW and, as they explain, they have plenty of ideas for A Quiet Place 2, some of which stem from what they weren't able to include in the first movie. Here's what Beck had to say about it when asked if they have thought about a possible sequel. "Oh yeah. Totally. We even have some of the set pieces already written for it. In a sense, that's what you have to base it around. You have to figure out, what is the worst possible situation to put your characters in and go from there." Bryan Woods added, "We have so many scary ideas that just didn't even make it into the final script, let alone the final movie, but just written, we would love to see this sequence. Some sequences that were just quite frankly too expensive to even do in this movie." A Quiet Place isn't exactly a low-budget movie, as Michael Bay's Platinum Dunes and Paramount clearly put a lot of money into it. But not everything filmmakers cook up in their minds can make it to the screen. Not to spoil anything, but A Quiet Place ends in a way that certainly suggests there are possible places to explore within the universe that has been set up. The movie also largely follows one family in a world that has been ravaged by the monsters in it though, so there also exists a scenario where A Quiet Place 2 could follow a totally different set of characters. When asked about how they envision tackling a sequel, Scott Beck had this to say. "I think at this point there's multiple universes that it could go in to be completely honest. I think you could continue down one path that's very obvious, or you could spin off into a completely unexpected direction. Which is certainly always interesting for us. The uncharted territory of filmmaking is always where you find the best inspiration." Horror movies are big right now and every studio wants franchises. In the case of A Quiet Place, it looks like Paramount may very well have found the best of both worlds. And they didn't even have to turn it into a Cloverfield movie. Scott Beck joked that, if they do a sequel, the biggest challenge could be the title saying, "I just don't know what the title would be. A Quieter Place?" They have plenty of time to figure that out as Paramount hasn't indicated they're going to pursue a sequel yet, but don't be surprised if it does end up getting announced.